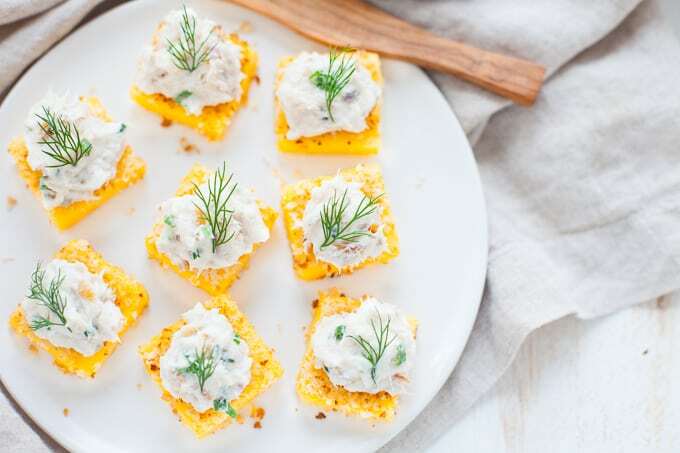 A fun and delicious seafood appetizer, these smoked trout polenta bites are sure to get your party started off right! This post is sponsored by Seafood Nutrition Partnership. Thanks for supporting the brands and organizations that make TFD possible! As always, opinions are my own. It’s funny but I don’t think too many people automatically think seafood when it comes to appetizers. Besides the ubiquitous mini crab cakes, you don’t see too many seafood appetizers being passed around at parties. Which is a total shame because seafood is a delicious and nutritious source of protein and it’s so versatile. Plus, there are so many varieties of seafood out there that the possibilities are really endless. That’s why from now on I’m starting my parties with seafood. Think hot crab and artichoke dips, mini fish tacos, smoked salmon crostini, sushi rolls….you get the drift. The thing I love most about seafood appetizers is that they are actually filling. Did you ever go to a party where all the hors d’oeuvres are like crudite and fruit and cheese platters? And then you find out dinner is NOT being served? And then you have to actually go grab take out after the event because you thought you were actually eating food there? Yeah, been there, done that. But with seafood appetizers, you will never go hangry. Because you’re actually getting some substantial protein, which contributes toward your satiety. 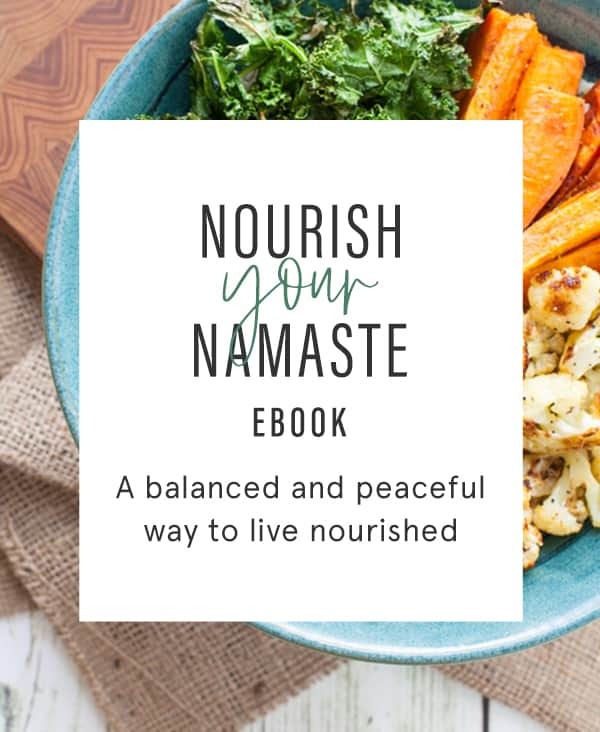 You can nosh around the party feeling like you ACTUALLY ate something and go home feeling satisfied. Plus, it helps contribute towards your recommended eight ounces (2 servings) of seafood per week. Not only is seafood recommended as part of a healthy lifestyle because of its lean protein content, it also contains high amounts of B12, vitamin D and is the only animal protein that has significant amounts of essential omega-3 fatty acids (EPA and DHA). Eating two servings of fish per week provides about 250mg per day of EPA and DHA, which is associated heart health. 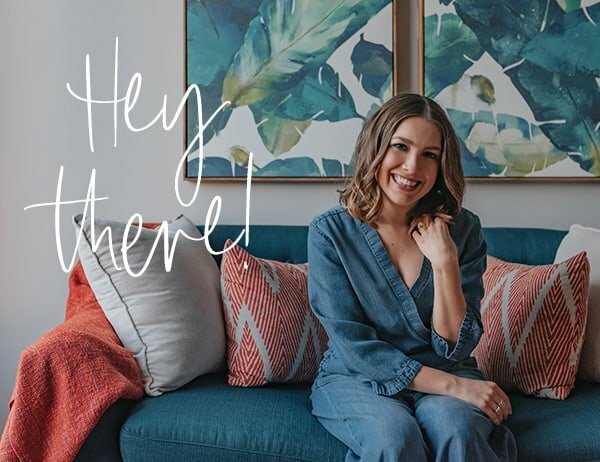 For all these reasons and more, I’m excited to be partnering with the Seafood Nutrition Partnership on the Start With Seafood Recipe Contest! 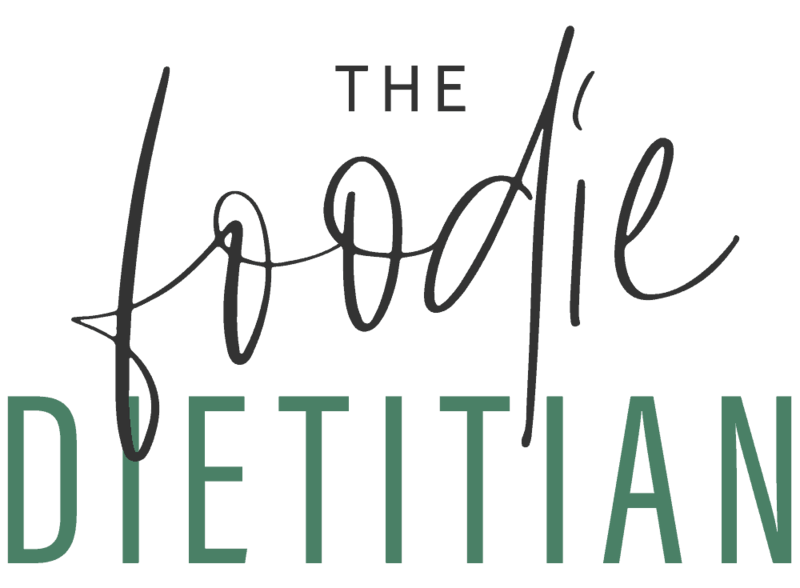 The contest is open to all U.S. food and lifestyle bloggers, including registered dietitians. It starts today and runs through October 19. Show us your best seafood appetizer recipe for the chance to win $1,000 cash prize! You can learn more about the contest and enter over at the Seafood Nutrition Partnership website. The first Start With Seafood appetizer I’m sharing today is picture-party-perfect. 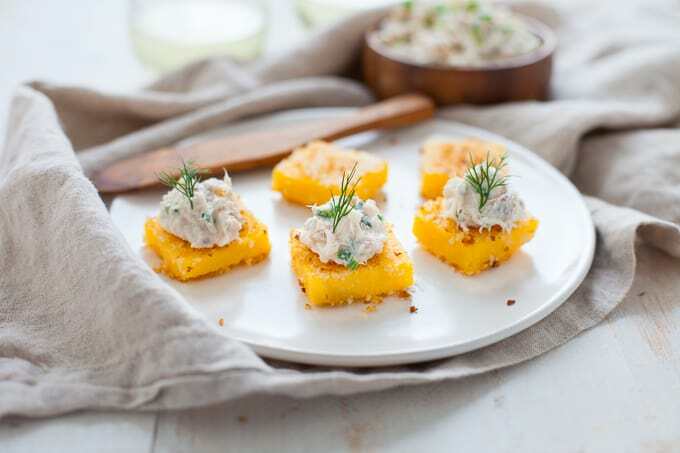 Bite-sized polenta (which is always a crowd-pleaser) topped with a smoked trout dip. Because you should be able to have your dip and eat polenta, too. Plus, crackers are like sooooo two months ago, anyways ;). 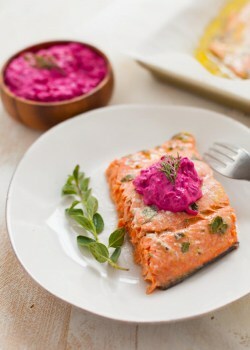 The smoked trout is mixed with Greek yogurt and creme fraiche for creaminess, chives to add a delicate oniony taste, and lemon juice to brighten the flavor. Top ’em off with a sprig of fresh dill for a pop of color. 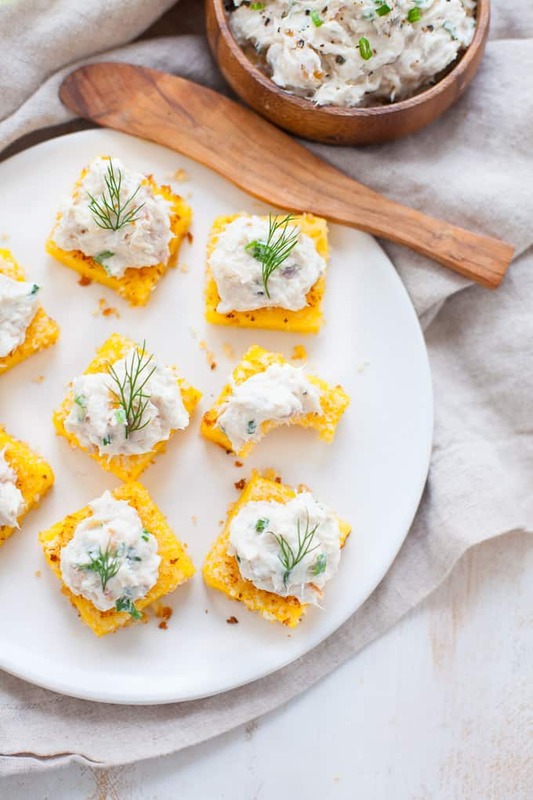 My recipe calls for a tube of polenta because realistically if you’re throwing a party and making multiple appetizers, you’re not going to have time to make polenta from scratch, pour it onto a baking sheet to cool and set, and then cut into little squares. Or, maybe you do have the time and in which case, more power to ya! Go for it. This recipe is super easy to make if you’re pressed for time but it’s so delicious your guests will think you spent hours slaving over the stovetop to make them :). In a medium bowl, break apart trout into small pieces. Add Greek yogurt, crème fraîche, lemon juice and chives and mix to combine. Salt and pepper to taste. Let sit in the refrigerator until ready to use. Trim the polenta’s rounded edges to create a long rectangle. Cut polenta into 14 squares, about ½-inch thick. Spread the panko crumbs out onto a plate. Press both sides of polenta squares firmly into panko to coat. Heat 1-2 teaspoons olive oil at a time over medium heat in a nonstick pan. Cook polenta squares in batches not to overcrowd the pan, 2-3 minutes on each side or until lightly browned. 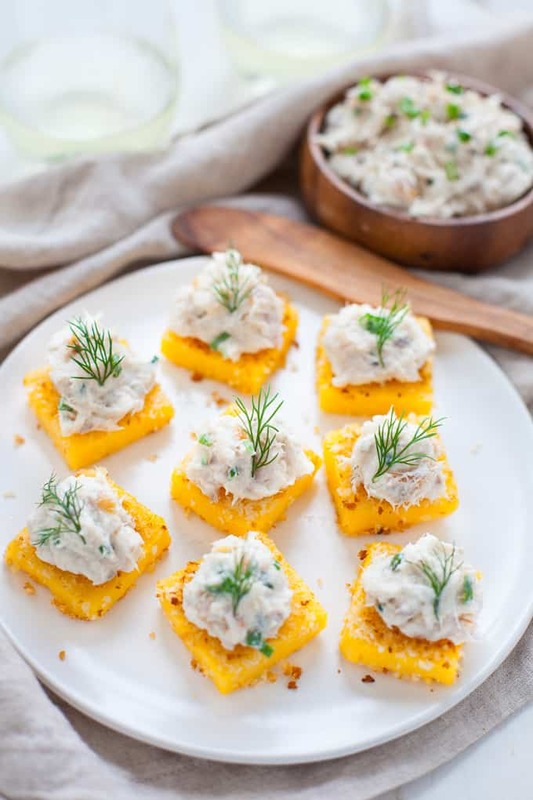 Top each polenta square with a small spoonful of the trout dip. Optional: Garnish with a sprig of fresh dill, as desired. 2 questions. Where do you find 12 oz cans of smoked trout or do you? Why not leave the polenta round and slice. Too big? I used smoked trout which comes in a vacuum sealed bag – you can find it near the seafood section of your grocery store or wherever smoked salmon is sold. Yep! Slicing the polenta round wouldn’t be appetizer-sized :). These DO look like a party-perfect appetizer. They sound so light and fresh, yet filling at the same time! Thanks, Brittany! All about the filling party apps! 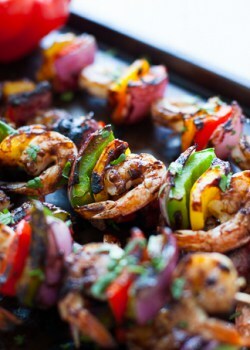 These sound so savory and delicious- perfect for a dinner party or happy hour! These bites look so beautiful. Definitely a crowd pleaser! I love all seafood and this sounds amazing! These are so pretty! Skipping the same ole crab cakes and trying these for my next gathering. Yay! Let me know how they turn out – enjoy! Yay! Yes, so fun for a tailgating party! 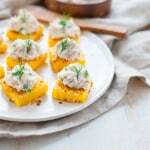 I am a seafood lover for sure and polenta!? These are screaming my name!! Yum!! There are so pretty and I agree with you about seafood appetizers. 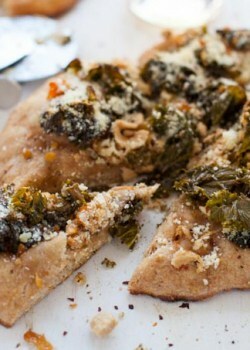 This recipe might convince some people to change their ways! The polenta makes such a great base. I hope so! Thanks, Mona!